If your energy bills seem a bit too high maybe you’ve got leaky ducts! Florida Power and Light (FPL) has many tips to help homeowners improve energy efficiency and, as a result, save money. One of biggest culprits of energy wastefulness is actually a little known problem but it is so common it is a major reason for inefficient heating and cooling. According to the energy utility, about fifty percent of all homes have leaky ducts that go undetected, causing electric bills to increase while negatively impacting air quality and comfort. In addition, FPL has branded ‘wall cavity return air ducts’ as the leakiest kind of all. How can you find out if your ducts are leaky? 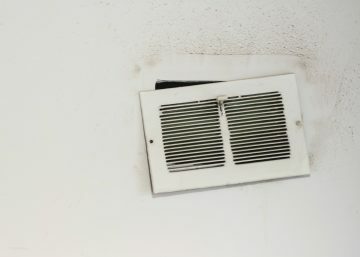 First, look for rapid dust buildup around vents in your home – that’s usually a sign of leaky ducts. Also, if your air ducts have louvered vents and are towards the bottom of your wall, near the floor, they are more likely to be leaky. Wall cavity ducts are a bad design especially if the cavity is not lined. FPL recommends eliminating wall cavity return air ducts completely and replacing them with return ducts in a better location such as on or near the ceiling. This makes perfect sense in Florida: since hot air rises and cold air falls, the high placement will optimize air flow. Custom Climate Concepts has a great deal of experience in determining if you have leaky ducts as well as repairing leaky ducts, duct replacement and relocating return air ducts. Why not get the most out of your home comfort system? If you suspect your home’s air ducts are leaky, call us today at 941-944-COOL (2665) or use our contact form.